ports of domestic merchandise or on a commodity basis. 3 or 4 month periods are desirable to identify underlying trends. imports, is not included in the export statistics. tation are excluded. None of the values have been adjusted for changes in price level. for "Commodities and transactions not classified according to kind" and "Low-value"
in using figures of relatively small magnitude. USCOII'4-DC For sale by die Bureau of die Censuz, Washington, D.C. 20233. Price l0~ per copy..
For sale by the Bureau of the Census, Washington, D.C. 20233. Price I0* per copy. Metal ores, concentrates and scrap....value..
Iron ore and concentrates....1,000 s. ton..
tin circles) ...............1,000 s. ton.. Mineral fuels, lubricants, and related materials ..value..
and related products).........1,000 s. ton.. Animal and vegetable oils, fats, and waxes ..... value..
grease and choice white grease.... 1,000 lb.. Soybean oil, crude and refined.....1,000 lb..
Cottonseed oil, crude and refined..1,000 lb.. Fertilizers, manufactured...... 1,000 a. ton..
NA Comparable data for other periods shown not available. See Special Notice on page 8_ of the January 1966 issue of this report. 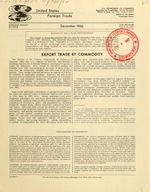 list of the Special Category commodities, see the January 1965 issue of Report FT 410. 4Includes base metals customarily used as ferroalloying materials, but not yet processed in ferroalloys. See footnote 3, above.